Caleb's parents visited us last weekend, and when I was baking and cooking in preparation for their arrival, I couldn't decide what dessert to make. Both Caleb's mom and dad are big-time coffee lovers, so I landed on these espresso cheesecake brownies. It's no secret that my kitchen is stocked with OXO tools, so when OXO sent me a brownie tool set, I was so excited! Not only were they great brownie-making tools, they were all part of OXO's Bake a Difference. 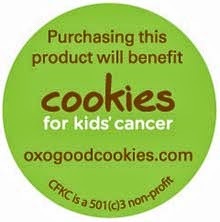 For each specially marked OXO product with the below tag, OXO will make a 25-cent donation to Cookies for Kids' Cancer. In 2013 OXO will donate up to $100,000 to Cookies for Kids' Cancer through these specially marked baking tools, bake sale matches, and other fundraising efforts. Cookies for Kids' Cancer is a non-profit foundation dedicated to raising funds for pediatric cancer research. Be sure to look for these specially marked baking tools when you're looking for your next OXO product! Heat the oven to 350 degrees. Line an 8x8-inch baking dish with foil. Lightly grease the fil. In a small bowl, combine the flour, baking powder, and salt. Whisk to blend, and set aside. Combine the butter and chocolate in a large heatproof bowl. Microwave in short intervals (20-30 seconds), stirring in between, until the mixture is just fully melted and smooth. Add the sugar to the chocolate mixture and whisk to blend. Whisk in the eggs and vanilla extract. Blend in the flour mixture just until incorporated and no streaks remain. Spread the batter into the prepared pan in an even layer and set aside. To make the cheesecake layer, combine the espresso powder and water in a small bowl and whisk until the powder is dissolved. In the bowl of an electric mixer, beat the cream cheese on medium-high speed until light, about 2 minutes. Gradually blend in the sugar and continue to beat until light and fluffy, about 2 minutes more. Blend in the vanilla extract, and then the eggs one at a time, scraping down the bowl after each addition. Add the dissolved espresso mixture to the bowl and blend in. Beat in the sour cream and then the flour. Pour the cheesecake batter over the brownie layer and smooth into an even layer. Bake about 30-40 minutes, just until the center of the cheesecake layer is set and doesn't shake much when lightly jiggled. Remove the pan to a wire cooling rack. once cooled to room temperature, cover and chill at least 2 hours in the refrigerator. To make the topping, combine the sour cream and confectioners' sugar in a small saucepan. Warm over low heat, stirring occasionally, just until the sugar is dissolved. Spread the mixture over teh cheesecake portion of the brownies and smooth into an even layer. Chill once more, at least 1 hour before slicing and serving. Disclosure: OXO provided me with the Bake a Difference Brownie Tool Set as part of their Blogger Outreach Program. All opinions are 100% my own. I truly love and use OXO products all the time. oh man - i would make these but brian is the opposite - hates coffee. they look delicious thought! woah girl these look and sound delicious! I wish I could have stopped by your house to try some! Hope you had a great weekend sweet friend! Oh these look amazing! love espresso desserts!